Sniper Elite 3 is the story of one bullet's journey from rifle to chest cavity, told hundreds of times over. From the arc of the bullet's trajectory to the way it severs a lung in half in gruesome, slow-motion detail, every single, well-calculated shot feels like it has the power to change the course of history. It's a shame, then, that the rest of the game doesn't feel as polished. Much more methodical than most modern military shooters, Sniper Elite 3 puts a greater emphasis on stealth--if you play it like Call of Duty, you will run out of ammo and end up getting shot to pieces. Levels are open, featuring multiple paths, choke points, hidden passages, and numerous perches to rain down precision death from above. I actually got hints of the Hitman series as I played--while not as diverse as those classic stealth games, Sniper Elite 3 gives you plenty of avenues to attempt different strategies, without funneling you down linear corridors. If the actual act of sniping wasn’t satisfying, we might as well just cut this review short and call it a day. Luckily, Rebellion has put a lot of effort into the art of the kill shot. While not as realistic as it could be, Sniper Elite 3 forces you to take numerous variables into consideration. Things like hit location, breathing, environmental sounds, distance and bullet drop--and on harder difficulties, even wind--must be noted and shots must be lined up accordingly. Aim assisting reticules help (unless you turn them off), but pulling off an expert shot from half a mile away while masking it with the sound of a low-flying airplane always feels gratifying, even with this little bit of modern convenience. While the eight mission campaign is the main draw here, there are a number of multiplayer modes to keep you occupied after you’ve demolished a decent chunk of the Axis forces. Competitive multiplayer is fairly standard, with a few distance-based twists on the typical deathmatch mode. Co-op, however, not only lets you play through the entire campaign with a buddy, but also features a mode which sees one player providing overwatch for the other on the battlefield. These modes won’t set the world on fire, but if you’re dying for more action, you’re not lacking for options. And then there’s the kill-cam—Sniper Elite’s signature move, and your reward for nailing these ‘impossible’ shots. The game slows to a halt as the camera follows the trail of your .30 caliber bullet right into the surprisingly fragile skull of your target, fetishistically showing--in excruciating detail--your foe’s brainmeats as they separate themselves from his person. Lungs, liver, intestines--and yes, even testicles--are given the x-ray treatment each time a shot hits a vital organ. It’s disturbing--yet grotesquely satisfying--the first few times this happens. By the third mission, it’s already worn out its welcome, becoming not a sick bonus for a shot well taken, but rather a nuisance to sit through until you regain control. The moment I figured out how to skip these became a bright spot during my time with the game. It’s not all sniping, though--and when things get hairy, you’ll be happy to know that you can hold your own. Land mines and dynamite can be set as traps to take down roving vehicles or protect a sniper’s nest from imminent attack, and pistols and automatic rifles can keep you alive when things get a little too close for comfort. Using these secondary weapons never feels as fluid or natural as the sniper rifle, but rather than being a detriment, it actually keeps you focused on staying quiet, only using them as a last resort. And if you do go loud, you can use sound to your advantage, as guards will swarm around the last place they remember hearing or seeing you. Combined with the open maps, you are given plenty of tools to stalk your prey, and respond accordingly if things go south. While each mission auto-saves at various checkpoints, make sure you get in the habit of pausing the game and saving whenever there’s a lull to avoid future and assured disappointment. Keeping your heart rate down and breathing will steady your aim, thus making more difficult shots easier to manage. Plus, it slows down time just enough to line up a shot right into your foe’s jibblies. On any difficulty other than Authentic, your rifle will show you a red icon as you’re breathing--this shows you where your bullet will land after wind and bullet drop affect its trajectory. Aim using that, and fire away. Sniper fire is stupid loud, and if you fire shots blindly, you’ll have half the Third Reich breathing down your neck. Use backfiring engines, aircraft, cannon fire, anything to mask your shots. Strewn about each level are various collectibles, like war diaries, playing cards, even hidden objectives. Not only do they fill in the sparse narrative, they also reward you with experience points to unlock new gear. Marked by a rectangle with a black circle on the map, these nests provide ample cover for sniping, as well as limited access--perfect for setting up traps for would-be attackers. Unless you’re comfortably holed up somewhere remote, you’re likely exposed--and if the enemy knows where you are, they’ll find you. Relocating allows you to get the drop on your foes as they search your last whereabouts. Running and gunning is a quick path to an early demise, so get the drop on your enemies as much as you can. This, combined with prudent sniper fire and knowing when to run, will keep you alive. Ammo can be somewhat hard to come by, so grab it when you can. And it may be dishonorable, but looting corpses will keep you topped up--and you might even find some upgrades while you’re at it. Unfortunately, this neat gameplay system is frequently undermined by technical issues. Enemies are either super-humans, able spot you around corners and shoot you through cover, or they’re completely oblivious to the fact that you just took out their buddy standing not six inches away. Certain areas are plagued with slowdown, and texture pop-in pervades the entire experience, whether you’re zooming in with your binoculars, or simply whipping the camera around too fast. And whether you’re throwing grenades or searching fallen soldiers for scraps, the overall experience just feels too imprecise--especially when it hangs its hat on a profession that requires expert precision. The story is also nothing to write home about either. Sniper Elite follows series commando Karl Fairburne as he head-shots his way across the various theaters of World War 2. This time, he’s made his way to the hot, sand-swept deserts of Northern Africa. His task: to stop the evil General Vahlen and his experimental tank factory at all costs. It’s clichéd even by war story standards, and it’s served even worse by the distance Sniper Elite 3 puts between you and the events that unfold. Karl speaks with a total of two characters during the entire campaign (I didn’t even know his name until I looked it up), and outside of one or two missions, he’s basically a lone wolf, skulking through the shadows. It makes sense, given his profession and all, but the narrative is missing that human element that make good war stories great. On top of that, all of the cutscenes are still images accompanied by Karl’s stoic narration. Names and places are dropped like dimes, but without much context, and each mission feels disjointed, seemingly existing for its own sake. Karl sneaks his way through eight interchangeable military bases, forts, and nondescript bombed-out villages as he partakes in generic war-themed objectives--kill the General and grab his intel, plant the charges and blow up the base, destroy the anti-air weaponry, and so on. 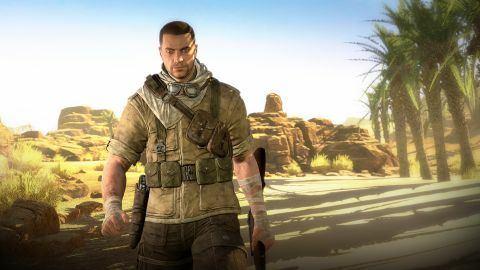 Its tan and bright yellow color palette is certainly refreshing, especially when held up against its contemporaries, but ultimately the locales of Sniper Elite 3 lack any distinct personality--just like its protagonist. Sniper Elite 3 certainly has its share of thrilling moments, whether you’re hunting blissfully unaware soldiers or being tracked by countersnipers in ghillie suits, but there are too many technical and narrative issues to simply ignore. In a world overflowing with military shooters, it takes more than an over-the-top kill-cam and a few neat ideas to shoot through the competition. Description Hone your skills and take down targets in the third game that challenges your accuracy.